Honeywell produces heat pump thermostats that are programmable or can be manually. There are only a couple of problems that can be corrected on a thermostat, otherwise it will have to be replaced. 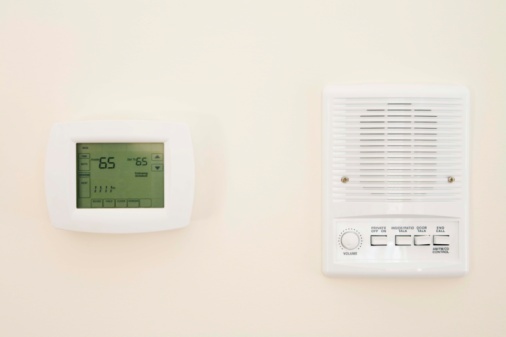 But there are a few troubleshooting steps that can help you correct issues with the thermostat. The thermostat should be located close to the return air grill and about 5 feet above the floor to gauge an even temperature of the home. Is the thermostat set properly? The switch should be set on heating or cooling mode and the ambient temperature should be plus or minus 2 degrees of the set temperature. The fan normally should be set in the auto mode. In the auto mode, the fan comes on when there is a demand for heating or cooling. When the fan is set on the on mode, it forces the fan to run continuously for constant circulation. Remove the thermostat from the sub-base with a screwdriver to loosen the two mounting screws. This will expose the thermostat's wires. There are six of them. Red is the power wire. Orange energizes the solenoid valve for the cooling mode. Yellow brings the compressor on for cooling. Green energizes the fan. White is for auxiliary heat. Black is the ground wire. The wires should be in good shape and have a tight composition. With a multimeter, check from the red wire to each of the other wires, one at a time. There should be a voltage reading of 12 volts or 24 volts. If you get the proper readings, it's time to change the thermostat. If the voltage is not present, check the secondary wiring of the transformer and make sure it is supplying the proper voltage. If there is no voltage reading, also check your breaker or fuse. If the breaker is tripped, reset it. If it is a fuse, remove it and check it with an ohm meter. If there is no reading, the fuse is bad and must be replaced. If the breaker trips again, or the fuse blows, you will have to call a qualified service technician.